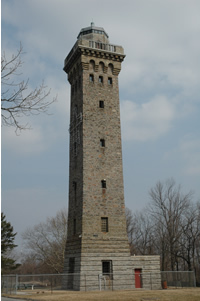 With its fieldstone construction reminiscent of a Medieval fortress, the William Penn Memorial Fire Tower is a Reading landmark that turns about as many heads as its Mt. 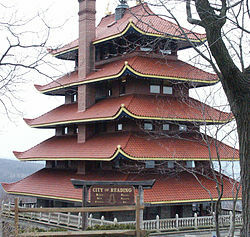 Penn neighbor, the Pagoda. While both structures are unofficial historic symbols of Berks County's largest city, the fire tower has a particularly strange history-- a history marked by irony, tragedy and perhaps even an Indian curse. While the tower that sits atop Mt. Penn is seemingly ancient in appearance, it was built in 1938 and opened the following year to replace an earlier tower that was constructed in 1889 by the Mt. Penn Gravity Railroad Company. This tower, as any Berks County historian is quick to point out, famously burned to the ground during the "Great Fire of 1923". This tremendous fire, which swept the mountain on the evening of April 24, 1923, burned over 5,000 acres and, according to newspaper reports, was visible for over thirty miles. At the time of the fire, the mountain was a popular resort destination owned and operated by the Mt. Penn Gravity Railroad Company, and boasted a large dancing pavilion, bowling alleys and concession stands, all of which adjoined the original wood-and-stone tower. While the nearby abandoned Summit Hotel was spared by the flames, the other structures were completely destroyed, with losses to the Mount Penn Gravity Railroad Company surpassing $25,000 (the equivalent of $367,000 in today's currency). This was a fatal blow to the company, which was already in a precarious financial situation; several years earlier, the company was found liable for damages arising from a tragic 1890 accident that occurred at a curve on Mt. Penn (ironically, the curve was locally known as "Cemetery Curve"), when one of its railcars jumped the tracks and rolled down the mountainside, killing several passengers. A series of lawsuits followed, and the company was still paying dozens of survivors and families of the dead and injured victims at the time of the 1923 fire. Because of the great financial loss, the Mt. Penn Gravity Railroad Company decided not to rebuild the tower. This was probably a wise decision, as it seemed that every business venture pertaining to Mt. 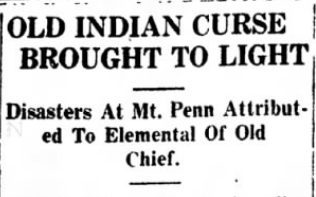 Penn was doomed to failure-- and many people blamed these failures and tragedies on an old Indian chief who purportedly put a curse on those who attempted to conquer the mountain. October of 1923 marked the city of Reading's 175th anniversary, and when local historians rummaged though the city's old records in preparation for the event they came across an interesting local legend. As the legend goes, when the last Indian was driven out of the vicinity by early settlers he made his last stand near the summit of Mt. Penn, and dramatically uttered a curse on the heads of the settlers. The spot where the Indian uttered the curse was said to be marked by black stones, which stand out in stark contrast to the white and gray rock native to the mountain. From that day forward nothing has ever grown on "The Black Spot", which still exists near the site of the fire tower, and no business enterprise atop Mt. Penn has ever prospered. 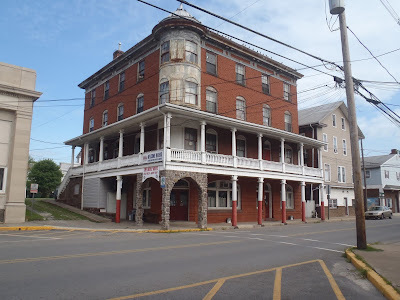 As for the Summit Hotel, which was built in 1891 by brothers Henry and William Schwartz, it passed through a series of owners, all of whom found the hotel to be a boondoggle of a money pit. It was abandoned for many years until the city purchased it in 1933. From 1933 to 1938 the city leased out the property as a bingo hall, before inexplicably passing a city-wide "bingo ban", thereby euthanizing its own white elephant in the process. Aside from the hotel, dance hall, bowling alley, concession stands and gravity railroad, other failed ventures on Mt. Penn include Kuechler's Roost (an inn established in 1878 by Louis Kuechler, a.k.a. 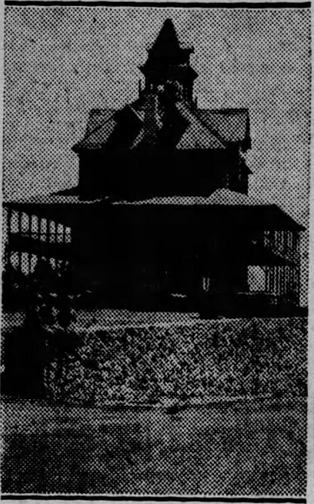 "The Hermit of Mount Penn", which was destroyed by fire in 1919), Carl Schaich's winery and, of course, the Pagoda, which was originally built as a hotel in 1908, but never opened. While the original fire tower atop Mt. Penn is but a ghost of the past, some pieces of it live on; after the Great Fire of 1923, stones from the tower were used to construct the Skyline Boulevard retaining wall and can still be seen to this day. Philadelphia Inquirer, Aug. 23, 1890. 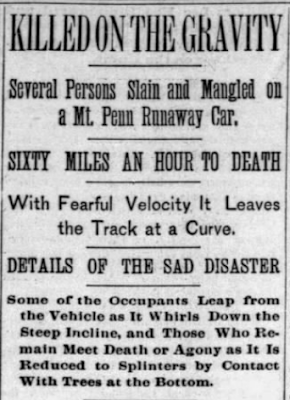 Philadelphia Times, Aug. 26, 1890. Indiana Gazette, Aug. 28, 1890. Reading Times, April 25, 1923. 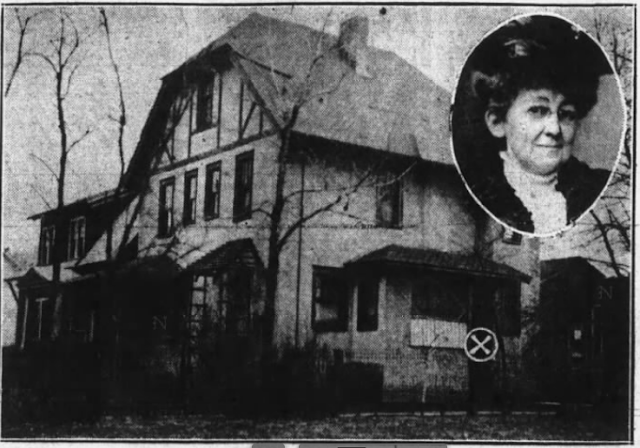 Harrisburg Evening News, April 24, 1923. Gettysburg Times, May 1, 1923. Reading Times, July 20, 1938.